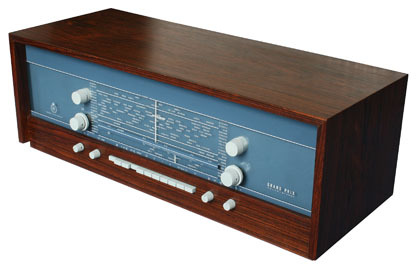 The Grand Prix 610 was the largest and most expensive table radio set in the B&O range of the time. It boasted impressive facilities, including a stereo amplifier for the reproduction of stereo records and tapes, a radio section with full coverage of all the wavebands then in use and the option of adding an FM stereo decoder and a delay unit for simulated echo effects. The large cabinet included two built-in aerials, a dipole for FM and a ferrite bar for AM which could be rotated by a control on the front panel. The FM receiver included a powerful amplified automatic frequency control (AFC) circuit that eliminated tuning drift as the set warmed up. During tuning, the AFC could be disabled either by pressing the external antenna button or by pushing the FM tuning knob (separate from the tuning control for AM) inwards slightly. A “magic eye” tuning indicator mounted behind the tuning scale showed the correct point of tune on all wavebands. Text copyright © Beocentral. Unauthorised reproduction prohibited. The powerful amplifier used four ECL86 valves in two push-pull circuits. An additional valve was used for the tone controls, making the audio sections both complex and comprehensive. Connections were provided for a record player (the 42VF was recommended, a B&O SP series magnetic pickup could not be connected directly) and a tape recorder, both of which could be stereo. Text copyright © Beocentral. Unauthorised reproduction prohibited. The set pictured is the “Moderne” variant and is housed in an “architectural” style cabinet without built-in loudspeakers. Other models with the same basic chassis were available in different styles. Though impressive, the Grand Prix 610 was soon replaced by the transistorised Beomaster 900 range, which offered similar performance and facilities in a much more compact package. Text copyright © Beocentral. Unauthorised reproduction prohibited.